Introduction of plain packaging law by Australia in 2012 was met with strong opposition from transnational tobacco companies (TTCs). While advocates of the law see it as a logical step in governmental efforts to curb tobacco use and improve public health in Australia, TTCs claim that the new law is scientifically unsound, overly intrusive and that it infringes a number of international law provisions relating to trademark and property protection. Some TTCs, either directly or indirectly,have decided to test the Australian measure before international tribunals. Although, these challenges are connectedwith interests held by TTCs in Australia, they should be seen as a part of a global struggle against new emerging international standards in the field of tobacco control. In this context, it is also submitted that these litigations can produce “regulatory chilling effect” with respect to activities of other states. This article aims to look at this problem more closely. The text proceeds as following. 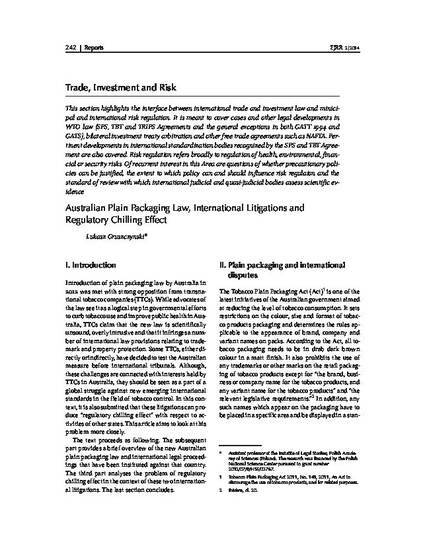 The subsequent part provides a brief overview of the new Australian plain packaging law and international legal proceedings that have been instituted against that country. The third part analyses the problem of regulatory chilling effect in the context of these two international litigations. The last section concludes.